Incredible tender and juicy baked pork tenderloin that’s marinated then baked. Slice and serve with a flavorful marinade sauce for an incredible (and easy) dinner! Say hello to your new favorite dinner recipe: Baked Pork Tenderloin with Marinade Sauce! You won’t believe how juicy, tender and flavorful this pork is! There’s always something going on. We literally have something to go to every night this week except for Friday. Insane. But let’s talk Christmas Eve dinner. What do you cook? Growing up, my mom switched it up every year and made something different which was always fun. I’m thinking this year I’m going to make this Baked Pork Tenderloin with Marinade Sauce for our Christmas Eve dinner! This is such an easy dinner because all you really have to do is make the marinade and toss the pork in. Let marinate overnight and then toss in the oven and bake it. Now, you have the option of tossing the marinade and eating the pork as is (delish!) or you have the option of pouring the marinade into a pan and cooking it and drizzling over the pork slices. Both are great options! Source of Key Nutrients: Pork provides several important vitamins and minerals. A 3-ounce serving of pork is an “excellent” source of thiamin, selenium, protein, niacin, vitamin B6 and phosphorus, and a “good” source of riboflavin, zinc and potassium. Lean Protein: Today’s pork is 16 percent leaner and 27 percent lower in saturated fat compared to 20 years ago. Seven cuts of pork meet the USDA guidelines for “lean” by containing less than 10 grams of fat, 4.5 grams of saturated fat and 95 milligrams of cholesterol per 100 grams of meat. And guess what? Pork tenderloin has the same amount of fat as a skinless chicken breast! Heart-Healthy: Pork is naturally low in sodium and a “good” source of potassium – two nutrients that, when coupled, can help regulate blood pressure. Pork tenderloin is certified as heart-healthy by the American Heart Association with its heart-check mark, indicating that it contains less than 6.5 grams of fat, 1 gram or less of saturated fat (and 15 percent or fewer calories from saturated fat) and 480 milligrams or less of sodium per label serving, among other criteria. Pork gets a bad rap for being “fatty” but really it’s not. There are so many great cuts of pork that are very lean and nutritious. 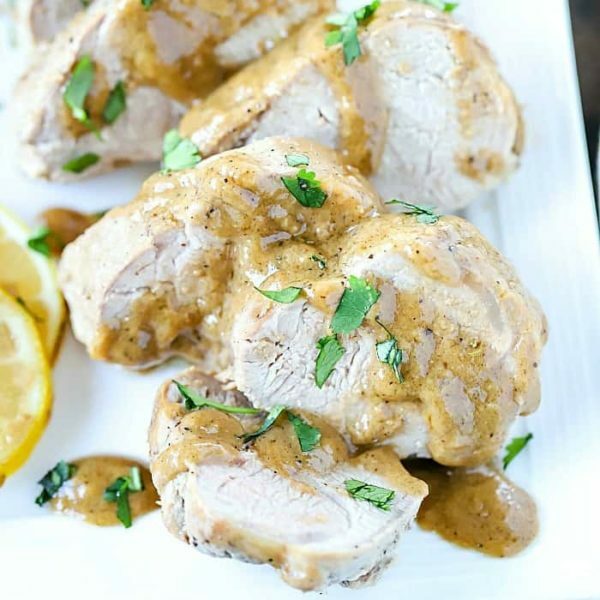 That’s one of the reasons I love this Oven Baked Pork Tenderloin with Marinade Sauce! It’s one of my favorite go-to dinner recipes! You don’t have to cook the marinade and serve it with the baked pork tenderloin. You can toss it and eat it without it – and it’s still delicious. Most pork tenderloins come in a vacuum sealed package with two pork tenderloins inside. This marinade recipe is plenty for two! You can customize this recipe and sub things in and out if you don’t have them on hand. For example, you can use amino acids in place of the soy sauce or onion in place of the shallot. ALWAYS use a thermometer to check the internal temperature on your baked pork tenderloin! I love this thermometer and it has great reviews on Amazon! Cooking times vary significantly due to oven capabilities and pork tenderloin sizes. Have a thermometer handy to check the internal temperature to ensure you get to 145ºF. Don’t forget to let your baked pork tenderloin rest for three minutes before slicing to serve! This allows the moisture inside the pork to redistribute through the meat so it’s nice and tender once you slice it. Combine everything except the pork tenderloins into a blender or food processor. Once thoroughly mixed, pour marinade in a large plastic bag over the pork tenderloins. Marinate for at least 3 hours. Heat a skillet to medium-high heat. Pour in 2 Tbsp. olive oil. Take the tenderloins out of the plastic bag and sear quickly on every side until light brown. Place tenderloins in a shallow baking dish. Baked uncovered in an oven preheated to 400º degrees F. Roast for 25-35 minutes (see note below) or until internal temperature on a thermometer reads 145º degrees F.
Meanwhile, pour marinade into a saucepan and bring to a rolling boil for at least 5 minutes. Remove tenderloins from oven. Let rest for 3 minutes before slicing to serve. Top with cooked marinade sauce and enjoy! Cooking times vary significantly due to oven capabilities and pork tenderloin sizes. Have a thermometer handy to check the internal temperature to ensure you get to 145ºF. The post Baked Pork Tenderloin with Marinade Sauce appeared first on Yummy Healthy Easy.